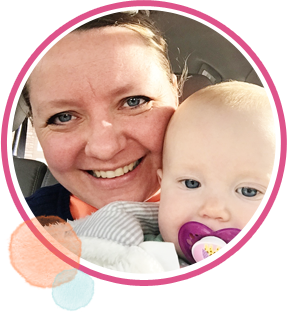 I’m here sharing a fun book with you today written by my friend Amber over at A Little Bit Biased and mastermind behind the pattern company Gigi’s Thimble. Her new book, Vintage Vibe, is delightful! 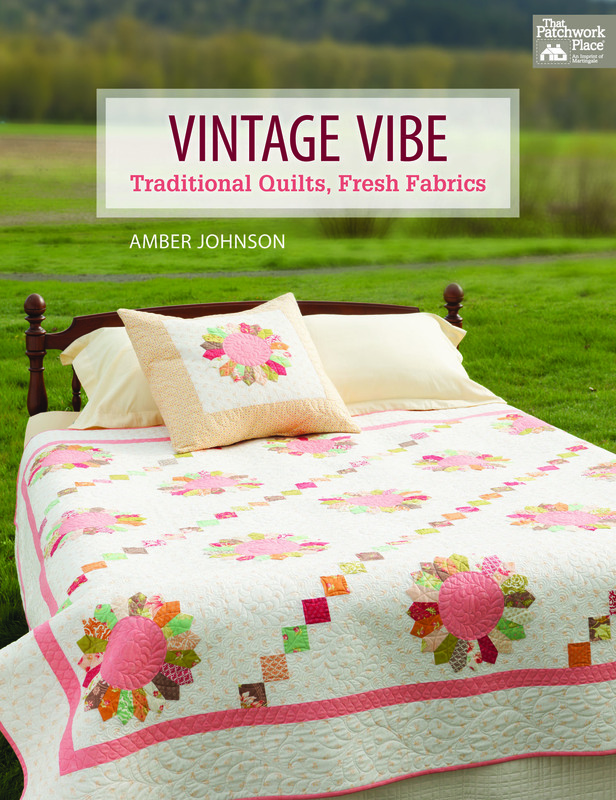 Amber has such a warm design style, and does a fantastic job of creating quilts that are timeless and beautiful. I think you guys and gals will love this book! 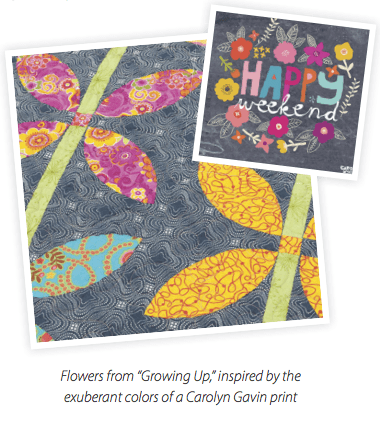 One of my favorite quilts in the book is called Growing Up: it’s a fabulous petal quilt, with some fun artwork for the color inspiration. Check it out! I just love seeing where people get their inspiration and ideas. It makes me look at everything around me a little bit differently! 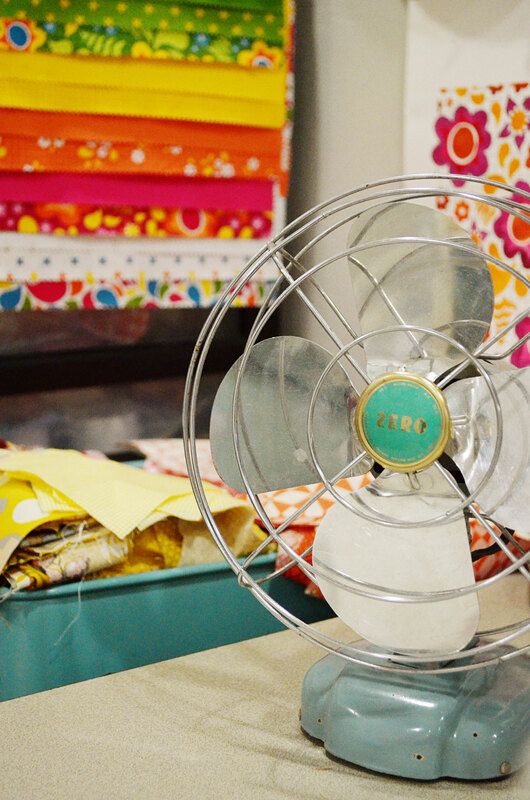 The title of the book is Vintage Vibe, which gets me thinking about this fabulous little fan I have in my studio. After my husband’s grandmother passed away, we had the opportunity to look through some of her things, and choose something if we wanted to. This little aqua fan came home with me! It works perfectly, and just needed a little dusting to look good as new! I love having it in my studio as a reminder of the great lady Grandma was, and her thrift and hardworking attitude. If you’d like to win an e-copy of Vintage Vibe, tell me about one vintage item you have in your home (or one you wish you had!) and what it means to you. I would love to hear about it! I will choose a winner randomly this Friday from all commenters, and one lucky person will receive a digital copy of this beautiful book! PS If you just can’t wait, you can purchase Vintage Vibe on Amazon, or an autographed copy via Amber’s ETSY shop. We have a black rotary phone. Our Granddaughter (age 12) loves it. When she is here, she calls her Mom. It really works. I have loads of vintage items that I use daily, including things that were my grandparents’, but the first thing that popped into my head is a fun, small planter shaped like a frog holding cabbage that I have next to my sink. I throw my pop top tabs into it, and eventually those tabs make it to The Children’s Medical Center here in Dayton to help raise funds. I have a beautiful red and white quilt that was made from my grandmothers quilting bee that was done at her farmhouse. My dad remembers playing under the quilt while they were buzy working away. It is beautiful, over 100 years old. My mom gave me holiday candles from the 50’s. I have Santa and his reindeer and a Pilgrim boy and girl and turkey. Considering they are wax and fairly small, I know she treasured them to keep them safe. My sister has the Carolers and a lightpole. I have an old juicer from my grandmother. The metal kind that you put 1/2 an orange in and then squeeze the handles together. Hi April! It was fun reading your post and learning about your cute fan that you got from your husband’s grandmother. 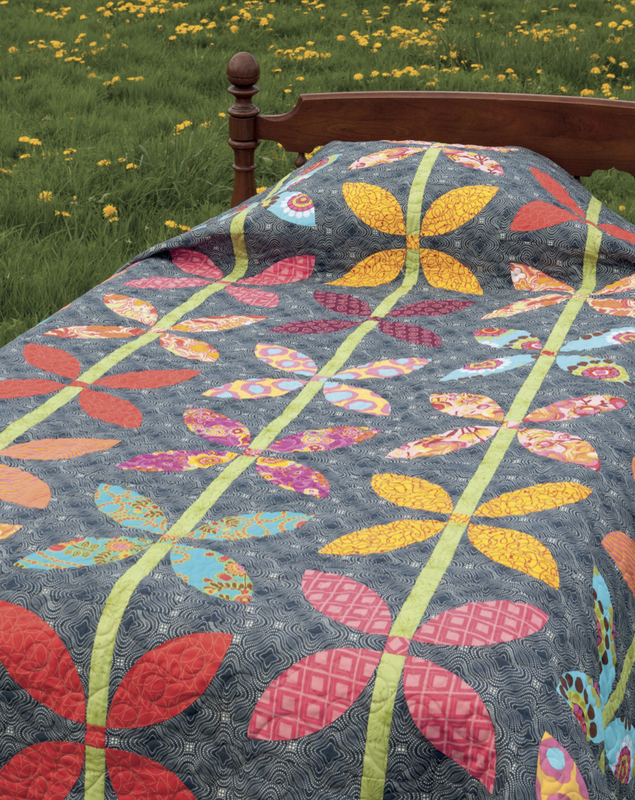 When my grandmother passed away I chose a quilt from one of the beds in her house. It’s hand quilted and I love it. Also, I have always loved vintage scales. I hope to get one one day. Thanks for the Vintage Vibe love! Glad you enjoyed the book! I have my Mum’s old kitchen clock which still keeps time as perfectly as ever ! I love cooking with bowls and scoops that have been passed down to me from my mother and grandmother. HELLO,I have a small flat iron about 4″ long of my Grandmother’s,so cute! Maybe it was used for ironing small children’s cap sleeves or pleats,not sure. Thanks April for your blog+sharing a neat giveaway too! When I helped clean out my grandma’s house, there was a three foot tall ceramic Christmas tree that I declined to take. It was so cheesy and lit up from inside. Now not a Christmas season goes by that I don’t wish that I had brought it home…. i have an old wooden desk that my mother found, restored and gave to my Grandmother.it has a lift up section on top so that you could keep a typewriter below and then cover it up when you weren’t using it. It needs to be restored again, but I love it. I can always remember where it was in my Grandmother’s house. I have a clown cookie jar that belonged to my mother when she was a child. I’ve always had it. It’s the only thing of hers that I have except photos. She’s passed away 37 years ago. I inherited a lovely old timber kitchen dresser some years back. I stripped, sanded and varnished it, got new vintage lead light glass doors put in and it has a new lease on life! I think of it’s history whenever I go to it. Love it, and love your fan! I have two vintage chairs – belonging to my grandmother and her older sister. The chairs came from their mother, who brought them to the states from England in the early 1900’s. I love them because my grandmother loved them! Thanks for the chance to win! I wish I had my grandmother’s cast iron griddle. I would love a quilt ladder to display my quilts. I have a lamp/clock combo that is ceramic. It has a ceramic lamp shade and on the bottom is a 18th century couple, wigs and all, on each side of the clock. It is a pretty blue and white flower design. I found this at an auction years ago and fell in love! Thanks for the giveaway! My kitchen table has a vintage vibe feel to it although it’s truly not vintage. I would love to have a vintage dresser or chest. thanks for the chance to win amber’s book ! I love your fan – its so nice to have little reminders. I have my grandmother’s clock – it used to sit on her mantle above the fireplace and it has a wonderful chime – I love that it still works all these years later and love that my father remembers when it was purchased ! Thanks so much for the giveaway! I have a mixing bowl that my grandmother had when she was setting up housekeeping in the 1930s. I use it to mix up most of my baked goods and think of her fondly every time I see it in the cupboard. We have my husband’s great grandfather’s console radio that was purchased new in the 1920’s or 30’s – my husband’s grandfather remembers listening to this radio when he was younger – it was passed down to my husband – we treasure it and display it in our living room. I have a cookbook from 1965 that was my step mothers and I still use it on occasion. When I use it I remember all the wonderful meals she made for her new family. I also have a small 5×9 replica of a hope chest that my mother received when she graduated high school in 1949. She kept her jewelry in it and when I look at it I remember how so very beautiful she was and how she always looked put together. I have hand painted plates given to my grandmother as a wedding gift from her sister. My grandmother was born in 1881. They are truly special to me. I have my Moms vintage embroidered tablecloths and also some hand crocheted pineapple design tablecloths too. They are all precious to me! The vintage item I have is from my Dad’s garage! He’s passed on 15 years ago and I adopted a old drawer from a treadle sewing machine cabinet. He had little odd items in the drawer…. I cleaned it and polished it and it sits in my sewing room holding thread! Reminds me of him every time I see it! I have one of those manual egg beaters. I was very lucky to get my Grandmother’s treadle sewing machine, as she was the one that got me interested in quilting. I also have a couple of the quilts she pieced on that machine.They are very special things in my home and heart. I have several vintage pieces in my home. The latest one I bought at an auction. It’s a Pfaff treadle sewing machine. The owner says it still works! I’m using it as a laptop desk in my sewing room. My favorite piece is my mom’s huge dough board she made cinnamon rolls and bread on for so many years. I see her love in every mark on that board. I have a beautiful old timber table which came from my grandparents home. In the late 1960’s their house & farm was destroyed by a bush fire, they lost everything. This table was given to them after the fires by my grandmother’s aunt (her house survived the fires) & it now has it’s place in my sewing room so I think of them everytime I sit down to sew. I think it is great that you have that fan. What a fun post! I think the only thing I have is cookie cutters. My mom kept them in an old cookie tin. I asked for them a few years ago. She sent them to me and then I found the exact same cookie tin. It was fun to see her reaction when she saw my cookie cutters in the tin a few weeks ago. :) priceless. I love your fabric! I have many vintage things. I have a collections of tea cups from my great grandmother and grandmother and I have my grandmother’s ssewing machine. They mean so much to me because those lovely ladies are my heritage. We are all married to farmers and live in the same small town. They had to do so much then me but I think of them all the time and they give me strength. They were also quitters! This looks like a great book. I have made some of Amber’s patterns and I love her designs and easy to follow instructions. We have a vintage treadle sewing machine that I love. I have even used it to sew projects when the electricity has gone off. It still has a great stitch. Can’t wait to get my copy of Vintage Vibe. I have a large ladle from my mother that hold a full pint! It is great for making jam and filling the jar in one step. I also have an iron that my grandmother used by heating on her coal stove. It feels like a connection to my grandmother who was a quilter without rotary cutters and plastic templates. They are the reminders of the strong women in my heritage. My mother had a large white aluminum pan in which she would mix the Thanksgiving stuffing. I inherited it when she passed away and every Thanksgiving I get out that pan to mix my stuffing. Maybe someday my daughter will want to use it too. I have an old iron that I bought at a flea market when I was stationed in Germany. It’s the kind you had to fill with hot coals. It reminds me of my crazy life in the army 35 years ago. I have a 150 year old table and chairs and several quilts that old. I have a sweet Singer Featherweight. Perfectly and wonderfully functional. Thanks for the chance. I have a collection of Wedgewood creamware dishes that were my great-grandmother’s everyday dishes, but we use them for special occasions. I love having little items around my house that connect me to generations past. I’m going to mention two – hope that is ok. I have a teacup and saucer that I received from my grandmother and her treadle sewing machine. I treasure them both. I have a “dresser scarf” that my great grandma embroidered. It’s beautiful :) Thanks for the chance to win! The flower quilt is fabulous! I would have snagged that fan too! I have an old metal tall stool that sits in my living room, it has such a vintage rustic look. I’m not an extremely sentimental person, because things can always be replaced, however I love the look of my stool. Great giveaway. My children’s great grandmother’s handmade quilts. They are simple, but warm and full of love. My children love to cuddle in them and it gives them a sense of their great grandmother. I have my grandmother’s little glass-topped kitchen table with metal chairs. We reprinted it red and have it on the porch. I’m so lucky to have it. Thanks for the nice giveaway. I have a large cast aluminum stew pot(?) that was my Mom’s. It works wonderfully and cleans up better than my modern cookware. I have quite a few vintage and antique things from both my and my husband’s families. One of my favorites is a small occasional table that belonged to my two maiden great-aunts who lived together all their lives. They were born in the 1870’s and some unknown relative brought the table to them from Japan, probably around the turn of the century. It’s kind of quirky, but I love it! I have two quilts my Great Grandmother made. I wish I new details about them, as I don’t even know how old they are. My best guess is they were made in the 40’s or 50’s. They are just for admiring now, as they have been well ussed and loved through the years. I have a ceramic plant container. It is of a little girl. My Uncle charle sent it with a plant and flowers to my mom in the hospital.. It was for the day she had us (I am a twin). so, this cute little planter is now more than 50 years old and reminds my of my beloved Uncle Charlie. I have a lovely Wedgewood platter given to me by a close friend of my mother’s. I would like to have the vintage Singer sewing machine with cabinet that is in my parents’ house. However, it originally belonged to my dad’s aunt, and he’s keeping it now for sentimental reasons. I don’t blame him, and I guess I just have to sew with it when I’m in town! That petals quilt is cute! We have a lot of vintage things here…a few quilts, including one made from my mom’s maternity clothes. I love looking at that and imagining her in all those 60’s and 70’s flowers. I have two very old hand pieced quilt tops a sweet friend gave to me a few years ago..she was 86 then…and they had been sewn by HER Grandma!! They are a Treasure to my Heart, because she entrusted them to me..and not her own granddaughters…. We have my husband’s grandmother’s bedroom set that his mother purchased for her in 1947. On the back of the mirror the writing is still legible stating his mother’s name and Belton, Kentucky and the name of furniture company in Louisville, Ky where the set was made. It was shipped by L$N Railroad to Belton. We have many vintage items – including some that are over 150 years old – that are family heirlooms. But the two items that I bought new myself and have used regularly ever since are a Kenwood Chef mixer that I bought in 1973 and a Pfaff 1027 sewing machine I bought in 1981! I was told recently that they now count as vintage! I’ve got several of my grandmas quilts and table doilies. I’m so thankful that I was able to have these. I’ve got so many memories of her making some of them. I use the doilies everywhere and it’s such a sweet reminder of her daily. I have a couple of dresser scarfs my grandma embroidered and crocheted a lace edging around. I have a school desk that belonged to my husbands grandmother. Her school burned down back in the early 1910’s when she was in the third grade, after which all the children then had to furnish their own desks. Back in the 1980’s she had it on her back porch holding her garden shoes when I asked if I could have it. Right now it is in my basement and our grandkids occasionally play school with it. I have my sisters antique sewing machine, complete with needoes, and two bobbins…,ancient! I’m so proud. I have a wonderful cabinet form th 1930s I’ve inherited from my grandmother. It was one of the last thing she said in her life that I should have it. I have it since I was 12 yo and it’s my most treasured things in my life and I’ll always cherish it! My husband’s grandma made a very sweet yo yo embellished pillow from her old aprons! It is so soft and lovaeable! I have an old ceramic pitcher that my grandmother used when she was selling milk. There is a liter mark on it, but it clearly says: “Not to be used for buying or selling”. I have a vintage thread cabinet! I love it!! Our bedroom set (4 poster bed, 2 bedside tables, and a 6’wide x 7’tall dresser with mirror) belonged to my husband’s uncle. He bought it when he got married in 1970. It’s a beautiful dark wood & is definitely not something we could afford on our own. I really love it! I have two favorite vintage items, both from my Grandmother. I have her embroidered pink gingham apron and her stork scissors. They hold a special place in my heart because, like my Grandma, I too love to cook and sew! I have a vintage log cabin quilt. It is so primitive. Nothing is straight, from cutting to stitching. Colors are unique, what she had. It served its purpose. Kept her children warm. I love this quilt. I have a stack of feedsacks in my sewing room. No cutting into them yet! Still at the petting and looking stage. I used to have a cool avacado green kenmore sewing machine. It kept overheating though, so I moved on to a modern one. Thank you for the giveaway. I have a sewing chest that belonged to my mother. She got it about 40 years ago, She has passed away so I treasure this as it reminds me of her. I love the vintage linens I have from my grandmother. I like to hold them and imagine my grandmother’s hands quietly creating the designs. I know the giveaway is over but couldn’t resist posting to tell you about my vintage item. I have an “Anna” bowl which was given to me as a wedding gift from Anna. Actually it is a Texas ware bowl and Anna gave all my siblings Texas ware bowls for their weddings so the bowls became known in my family as the “Anna” bowl. When my husband’s grandpa passed away in his 100th year, we were also given the opportunity to look through a few of his things. We took home the little dinner bell. It has leaf designs neatly etched around it and the stone ringer is attached by a wire. We love it! I am blessed to have some of my grandmother’s quilts! I decorate my home with them!! I have my grandmother’s glass rolling pin and I think of her every time I use it. I have a beautiful hand saw that is in my husband’s workshop. I love old tools. I have lots of vintage potato mashers. We look for them everywhere in antique shops. My 86 year old mom makes baskets using them. They’re beautiful, and she sells a lot of them. I love anything vintage, and I’ll always treasure the baskets she’s made for me. I have some vintage sewing notions that were given to me not that long ago that I have been slowly using as some decorations in my craft room!